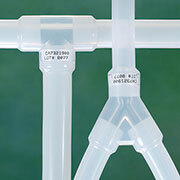 Single use silicone manifolds are manufactured by molding straight sections of tubing or hose with connectors of various styles such as T's, Y's, and reducers. Most molded connectors provide a seamless transition for a continuous, unrestricted, leak-proof flow by eliminating the use of barbed fittings. 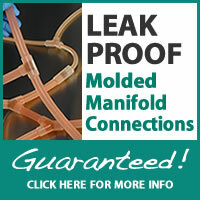 Manifolds are custom made to your specifications. 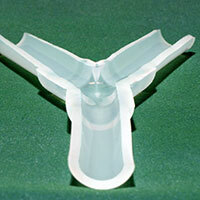 Certain silicone materials are available with validated sterility assurance of 10-6 per ISO 11137 method VDmax. Choose from the connection options listed here or suggest your own. Many size combinations are available for each type of connector, and other sizes are in development—talk with a representative for details. Connections are available for use with AdvantaSil APST unreinforced silicone tubing, APHP high pressure tubing, APLT ultra low temperature tubing, and APSH braid reinforced silicone hose. 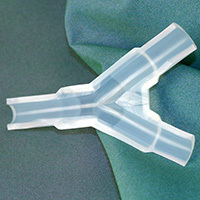 Silicone manifold connectors are not intended for implantation or continuous steam applications. Size range: .125" I.D. x .250" O.D. to: 1" I.D. x 1.405" O.D. Size range: .063” I.D. x .188” O.D..
to: .625” I.D. x .990” O.D. to: .625” I.D. x .875” O.D. Size range: .125” I.D. x .250” O.D. to: .750" I.D. x 1" O.D. Various size combinations within this range are available; call for details. Size range: .188" I.D. x .375" O.D. Available with polysulfone or stainless steel backing cups. to: 500” I.D. x .875” O.D. Most sizes available with polysulfone or stainless steel backing cups; some larger sizes available with stainless steel only. Many size combinations are available, and other sizes are in development—talk with a representative for details. Connections are available for use with AdvantaSil APST unreinforced silicone tubing, APHP high pressure tubing, APLT ultra low temperature tubing, and APSH braid reinforced silicone hose. DocuLink is our silicone manifold identification system providing individual identification and tracking information directly on each manifold in the form of a silicone-encased label. 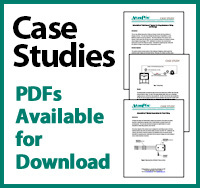 Manifold information can be linked to an on-line data management site to provide easy document retrieval for audits and validations. Have your single use system gamma irradiated before it arrives at your location and save the additional inventorying, transportation costs, and transit time. Bagged and labeled products are picked up from AdvantaPure's facility and conveyed to a local gamma irradiation service provider. Using Cobalt 60 radiation, microorganisms and bacteria are destroyed while your single use system remains in its original packaging. Products are then returned to AdvantaPure for final inspection and shipment to your location. A number of AdvantaPure's silicone and AdvantaFlex products, particularly those designed for single use, are available with validated sterility assurance of 10-6 per ISO 11137 method VDmax. Contact us for more information at 1-888-755-4370. The cutaway view above of a molded Y connector shows the smooth interior created by the molding process.